Notes: This is probably the most famous of many streamers designed by Carrie Stevens of Madison,Maine. Carrie, the wife of Maine Guide Wallace Stevens, took a break from her camp chores and tied a streamer which would resemble a small baitfish. She tied a bunch of white bucktail under the hook, and two olive-grey saddle hackles on top of the hook, then took her creation to the Upper Dam pool, where she promptly hooked a 6 lb, 13 oz brook trout. She entered this fish into a contest which was being held by Field and Stream, winning second prize, and upon receiving a flood of orders for her new pattern, she found herself in the flytying business. The Gray Ghost continues to be a very effective streamer pattern within many Sierran lakes. The Gray Ghost Special is a variation of the pattern mainly used with smaller hook sizes to offer a compact size. 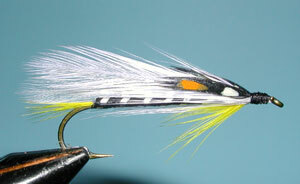 Most of the Sierran Fly shops will sell this pattern as a Gray Ghost since it is commercially tied in ample numbers. The Black Ghost was developed by Herbert Welch in 1927, although there were some earlier versions dating back to 1919. Herbert was a taxidermist, fishing guide, and an accomplished artist living at Haines Landing, Lake Mooselookmeguntic, Maine across the lake from Carrie Stevens. He operated a fly shop at the lake carrying both his and Carries' flies. 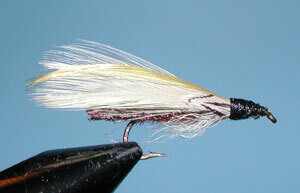 Herbert claimed to be the first to tie featherwing streamer flies. He used reshaped bluefish bait hooks to the length necessary for the streamers he created. The Black Ghost became very popular in the 1930's while the Percy Tackle Company of Portland, Maine produced them in quantities. 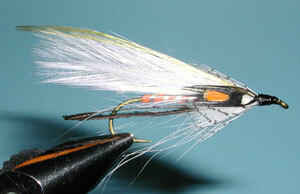 The fly is very effective as a streamer pattern and remains popular today. Another Sierran variation is the Brown Ghost, tied by Robert Broughton of Sparks, Nevada. You will find this pattern in some of the fly shops around the Eastern Sierra. It's a slightly simplified variation using a chenille body ribbed with Gold Wire. The underwing has been eliminated and the Golden Pheasant crest is replaced by a collar hackle that comes from the back of a Golden Pheasant and has many of the same colorations as the crest. 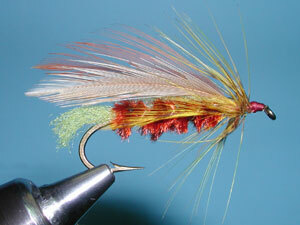 The cheeks are simply grizzly dyed yellow saddle hackle tips.